If you stop to reflect on your current season right now, what would you say? Just pause and think about that. celebrating your last kid graduating from school? recovering from a broken heart? Starting fresh can stir up all sorts of emotions. Some of these changes are exciting life events that we want to capture in pictures and Christmas ornaments. Other events shake us, catching us off guard. No matter where you find yourself, how you navigate during your new season impacts how you progress where you are and effects where you go next. 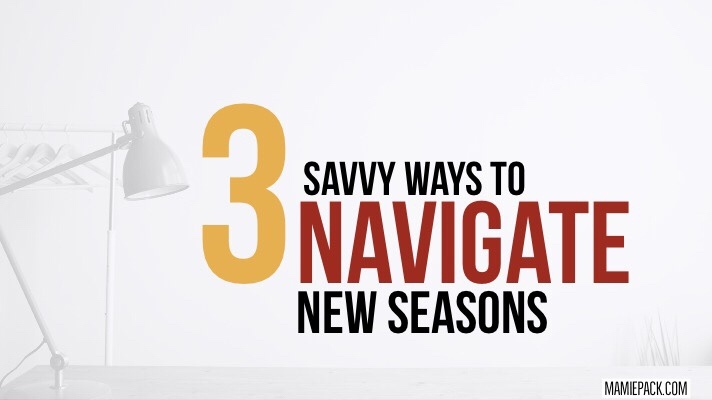 So how can you navigate through this new season? In the natural, we know that different seasons occur at various times throughout the year. We know when the seasons are about to shift because of evidence happening around us. For example, we know fall is about to come because the leaves begin to change colors and the temperature starts to dip. Just as there are different seasons and signals that a season is about to shift, the same can be seen in our lives. What is happening around you? What is the Holy Spirit showing you? The Bible tells us “For everything there is a season,” (Ecclesiastes 3:1) and that “God created everything beautiful for its own time” (Ecclesiastes 3:11). Every season of our lives can be used for God’s glory. He is in control over all seasons, both naturally and within our lives. There will be seasons of growth and abundance, as well as hidden and dry seasons. All of them work intricately within God’s plan for our lives. If you are not sure about your season, seek God for direction and listen to the Holy Spirit. Each new season comes with adjustment. We may experience some growing pains and discomfort as we adapt to the new norm. New expectations need to be set. Grace will need to be extended. Creating space will be needed, so you are still enough to hear God’s voice in the midst of stress and pressure. Regardless of what season you are in, your mind, body, spirit, and heart need time to adjust to where you are NOW. We need to allow ourselves the space to let go of the old season and choose to be present for the current process. How we shift into the new season and our attitude in the midst of it has a significant impact on how we prepare for the next. If you are in the hidden or dry season, are you bitter? Do you blame God or others for where you are? Can you rejoice? If you are in the growing or overflow season, have you forgotten that it was not your gifts or your education that put you where you are now? Do you take credit or do you give God glory? How we steward our new season is essential. Don’t rush through it. In ALL things, in ALL seasons PRAISE God. No matter our season, we can choose to see that “God causes everything to work together for the good of those who love God and are called according to his purpose for them” (Romans 8:28). When we are in Christ and submitted to His will, then we also accept that ALL of our seasons work together for our good. This fresh start is a new opportunity to use our story to give God glory. Let us use our voices to offer up praise to a loving Father who desires the best for us. So praise Him for the new house. Praise Him when the children are small. Praise Him when you are single. Praise Him when you start the new job. Transitions into the new season are new opportunities for us to see our God move in ways that keep us in awe. Never thought about looking at everything this way. Good read! Thank you for sharing with us. Thank you so much for these reminders! And I think remembering to give yourself time to adjust is so key. Things rarely settle quickly. Yes!!!! It’s so easy to just move from one thing to another without giving ourselves and others time to adjust. Love this list!! Especially the tip about adjusting! I think that sometimes we’re so excited about stepping into the new season, that we don’t take the time to step back and really assess where we are. Such great perspective in this post! Exactly!!!! I think it’s important to reflect on where we are now and how that impacts us and those around us. Thanks for stopping by! This is a great post. So refreshing to see other Christian mamas out there. Thank you for this reminder! Oh, thank you for stopping by! Yes, I don’t know where I would be without Jesus in my life. Changed EVERYTHING!!! Yes! There is so much pressure to go, go, go. Our minds, hearts, and bodies need time to reflect, process and adjust. Wow…food for thought! I love the part about reflecting and adjusting! I take to to reflect every week about the week before! I do too! It helped me to stay focused and to cultivate a heart for gratitude. Do you use a reflection journal? Amandela, It's a pleasure to meet you! Yes, I needed to read this. I have going through a whirlwind of seasons and I am not complaining but I do feel like I have lost my faith and I hate that so much. I recently downloaded a devotional on my phone. I really hope to find my way soon so that I can teach my daughter some of the principles listed in this article. Oh, thank you for being so transparent. It is wonderful you are taking the next step and digging into God’s word. Continue to seek Him and he will direct your steps. This is such a well-thought out, very articulate post. I’m walking through a rough season currently and absolutely needed to read this. Thank you for sharing!